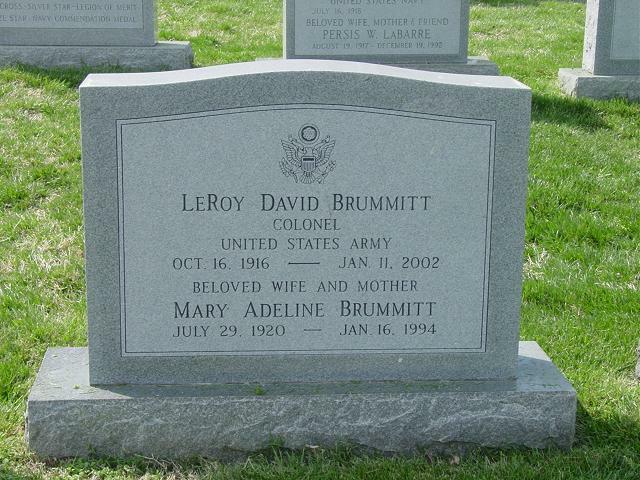 On January 11, 2002, LEROY D. BRUMMITT, COL. USA (Ret.) of Satellite Beach, Florida. Born in Excelsior Springs, Missouri, in 1916, where he graduated from high school in 1934. He later earned a BS from the University of Maryland and MA in International Affairs from George Washington University. During World War II, he rose from drafted Private to Major and command of a Parachute Infantry Battalion and served with the 82nd and 17th Airborne Divisions in Europe. After the war, he was tendered a Regular Army Commission and served in a variety of command and staff positions in Germany, Japan, Taiwan and the US. After completing the Army War College, he was assigned to the Army's Chief of Research and Development Office in Washington, 1961-65, where he served as Senior Military Advisor to the Research Analysis Corporation, McLean, Virginia. Military awards and decorations include Combat Infantry Badge, Master Parachute Badge with 2 Combat Stars, Silver Star, Legion of Merit, Bronze Star with V and 1 Oak Leaf Cluster, Army Commendation Ribbon with 1 Oak Leaf Cluster, Purple Heart, Presidential Unit emblem and French Fourragerre. Upon military retirement in 1965, he was employed by American University as Associate Director, Center for Research in Social Systems. He became Institute Director when Center transferred to American Institutes for Research, Washington, DC. Later, he joined Holton Arms School, Bethesda, Maryland, as Business Manager and retired in 1976 to Satellite Beach, Florida. He performed volunteer service in retirement. Survivors include three children, Susan M. Roth, Cary, NC; John D. Brummitt, Pennsburg, Pennsylvania and Ann E. O'Brien, Sparks, Maryland; five grandchildren and three great-grandchildren. He was a member of the Retired Officers Association and Holy Apostles Church, Satellite Beach, Florida. A memorial service will be held at the Fort Myer Chapel, 11 a.m. on February 22, 2002 and funeral services will be at Arlington National Cemetery immediately following. In lieu of flowers, contributions can be made to the 507th Parachute Infantry Regiment Memorial Fund, Inc., 4156 Millstone Ct., NW, Norcross, Georgia 30092.